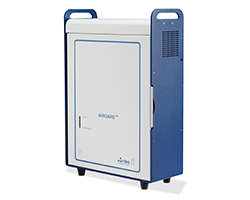 AIRGARD is an FTIR-based ambient air analyzer for continuous monitoring of chemical warfare agents (CWAs) and toxic industrial chemicals (TICs). It applications include: building air-handling monitoring; enclosed public area air monitoring for arenas, subways, airport terminals, large office buildings, etc. ; and air sampling and threat warning around CWA and TIC manufacturing and storage facilities (CFATS). Rapid detection and identification of CWAs and TICs. Very low false alarm rate. Visit COTS Solutions for detailed AIRGARD product information and specifications. KD Analytical provides operator training for the AIRGARD in our MKS AIRGARD Training Course. KD Analytical Maintenance Management is a suite of services that can save you money and time while helping to guarantee the readiness of your MKS AIRGARD and all of your analytical instruments. ReadiTrak web-based asset readiness manager tracks instrument status, preventative maintenance, repair history, and maintenance costs of your AIRGARD instruments and virtually any other gear your count on to do your job. One-call, 24x7x365 reachback support for AIRGARD and all of your instruments, regardless of manufacturer. Our analytical instrument experts help you complete most maintenance over the phone, saving you money. Expert repair for your AIRGARD provided by our support center. And, we manage OEM/warranty repairs when needed, eliminating headaches and reducing downtime for your team.